It was nearly dark by the time I finished Day 3 of planting. I seemed to have 60 pepper plants (where did those come from?). So Wednesday morning, here's where I was at. 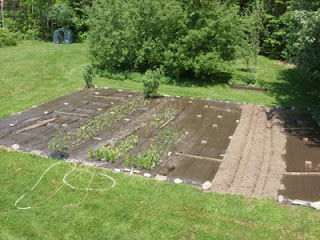 The four giant tomato plants went in last, bringing my tomato total - at this moment - to 60. This afternoon I need to get the rest of the seedlings in and do some row cover stuff to keep bugs off. I see some clouds rolling in so maybe it won't be as hot as it could be. It'll be a busy afternoon, trying to get things finished before I head to my grandmother's for a couple of days to help around the yard. Plus I am delivering her giant tomato plant. The car will be crowded.